Sup this week... how about a friendly bump. Welcome. There is a lot of knowledge here. What next one from Nintendo for copyright infringement for him using Mario in his avatar. 20 years ago today. I was watching that game. That is a record that might be tied but highly doubt it will ever be broken. I stumbled across your profile when I was reading a thread about '90 Aqueous cards and saw that you are both a Gwynn collector and live near me. I joined for the sole purpose of seeing if you would have any interest in a BGS 8.5 '98 Dugout Axcess Gwynn #126 with a piece of game used uniform (up by the grading label). 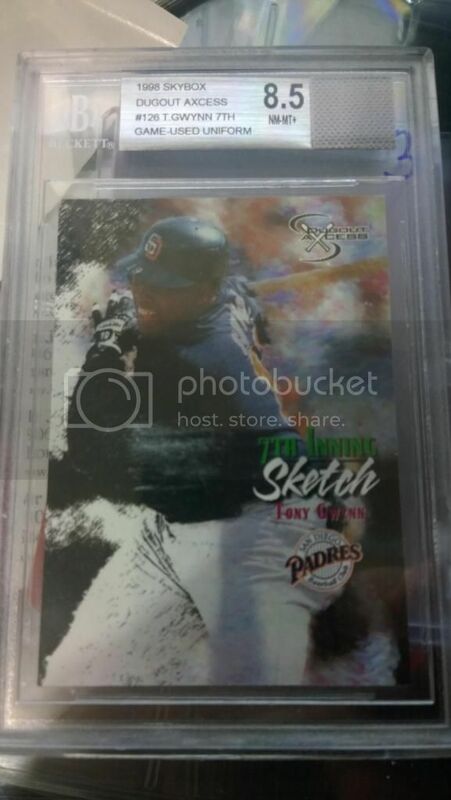 I can't imagine it is worth much of anything but I'd rather it go to a Gwynn collector than gather dust in a box as it did during my 10 years off of collecting. And just in case you don't have these pretty minor cards, I have 01 UD Big League Beat BB13, 00 UD Hitter's Club 67, 00 Impact 36, 99 Ultimate Victory 93, 00 UD 264, 98 Ultra 491, 00 Topps Gallery 118, 99 Bowman 264, and 13 Topps 72 Minis TM43. Would be looking for any Mariners I don't have. ...llenge!! ;) Thanks, cjedmonton! Always a fun game! 07:38 PM - Gwynn545 mentioned trizzo22 in post FCB Fantasy Football 2018!! 12:03 AM - linuxabuser mentioned Gwynn545 in post 90's Break - we're full! 09:58 PM - Gwynn545 mentioned Juanlasttime in post 90's Break - we're full! 05:59 PM - MansGame mentioned Gwynn545 in post 90's Break - we're full! 10:05 PM - linuxabuser mentioned Gwynn545 in post 90's Break - we're full! 01:59 PM - linuxabuser mentioned Gwynn545 in post 90's Break - we're full! 02:35 PM - banjar quoted Gwynn545 in post 1997 Topps Stars All-Stars: WTF? 08:28 PM - Letch77 quoted Gwynn545 in post FCB Fantasy Football 2018!! 08:06 PM - jszczech quoted Gwynn545 in post FCB Fantasy Football 2018!! 10:53 AM - Gwynn545 quoted linuxabuser in post 90's Break - we're full! 09:05 PM - Gwynn545 quoted JVHaste in post 90's Break - we're full! 01:59 PM - Gwynn545 quoted tidel144 in post 90's Break - we're full!